The trek, under the banner ‘Walk While You Can’, took three weeks from 10 July and saw hundreds of well-wishers join him along the route in a show of solidarity. 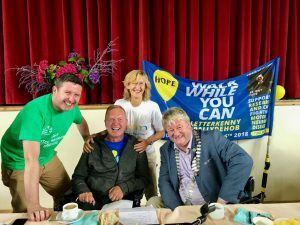 The Mayor of Cork County, Cllr Patrick Murphy, who is a wheelchair user himself, was among those who turned out to welcome Fr Tony Coote at the conclusion of his 500 km trek from Letterkenny to Ballydehob to raise awareness and funds for Motor Neurone Disease (MND). Fr Coote, who is based in the Mount Merrion and Kilmacud parishes in Dublin, was diagnosed with MND in March 2018. The disease has made itself felt quickly, as the 54-year-old former UCD chaplain has already lost the use of one of his legs and one of his hands. Over 130 people in Ireland are diagnosed with MND each year, but only three specialist nurses, all of whom are funded through charity and not by the state, are available to help sufferers throughout the country. Part of Fr Coote’s motivation for his massive undertaking was to raise awareness of the plight of MND sufferers in Ireland and to improve services.